Does the NFL Not Know Their Fans — Or Are They Embarrassed by Them? RUSH: I saw it. I watched the Goodell press conference yesterday after the two owners’ meetings. There were two meetings. Goodell met with some of the owners and the players, and then there was the full-fledged owners meeting. After that, Goodell came out, and it is… You know, I don’t know. I really don’t know if the NFL and other corporations… I don’t know. I’m undecided. I don’t know if they really don’t know who their audience is or if they do know and are not particularly crazy about who the audience is — and don’t laugh at that. I mean, there are a lot of corporate entities who want to be viewed as hip by virtue of who their customers are, users, or what have you. I mean, everybody’s done this, although we were first with the premise and with the idea, to create these montages to illustrate the repetitiveness of people or the similarity in speech patterns from person to person the Drive-By Media. But Goodell just kept… It was like he was on a loop talking about our “issues” and our “community.” It went on and on and on and on. It was all he was talking about, coming together on our “issues” and on our “communities,” and I’m thinking, “This is not what the NFL is at all about.” So I asked for the montage even though Cookie said, “I didn’t give it to you today because everybody’s already done it.” I said, “I haven’t, and we invented it here way, way, way back years ago.” So I’ve got this ready to go. I just… This is so off the mark in how to deal with the problem they’ve got that I am really wondering if they get it. We just assume they do because they’re paid gazillions of dollars and their CEOs and these organizations/companies can find the best and the brightest people in the world if they want to. So we assume that they think they do, and it just doesn’t make any sense to us, doesn’t make any sense to me that they would be led by people that don’t really know who their audience is. But then if they’re a bunch of liberals, by definition their whole belief system has been corrupted and skewed. So I’m holding out the possibility that these people don’t get it. Their numbers are continuing to decline — and, by the way, not just the overall league numbers, but in the local markets as well. Local television? Well, that would follow, but it hasn’t been reported as such. When it comes to network money, network money sustains the NFL, for example, I think they probably believe that money is always gonna be there because what else is there to televise on Sunday afternoon? In the fall and winter, what else is there to televise on Sunday night? Well, there actually is a lot to televise on Sunday night. Monday night as well. But primarily Sunday afternoon and on holidays, traditions. I just wonder if they’ve really gotten to the point where they take sold-out stadiums for granted. I mean, in New York, the Giants and Jets have 20-year waiting lists. They don’t anymore, but they did. So you wonder how much of it they take for granted. ‘Cause I’m watching these guys say what they’re saying and reacting to their problem, and it’s one of two things: Either they just are so consumed with Trump for “hijacking” their season… When, in fact, it’s not been Trump that hijacked their season. Their players hijacked the national anthem. The players have hijacked the flag. Their players. I saw Michael Bennett, who is an offensive lineman for the Seahawks. His brother, I think, is a tight end for the Packers. His brother is Martellus Bennett. But Michael Bennett’s the guy that was involved in the Las Vegas shooting over this summer where he claims that the cops mistreated him because he’s African-American. (sigh) I keep reminding myself as I get off to tangents, but don’t worry. I always zero back. They have a problem kind of like faux celebrities do. Have you heard of people that get pulled off the road by the cops and say, “Do you know who I am?” The cops have no idea. It’s just not how people talk. It’s how liberals talk and it’s how they’re taught to speak at college campuses: “Our communities.” What communities? NFL teams have players that play for the National Football League. That’s their community. But that’s not the kind of community Goodell is talking about. They’ve got it in their heads now that the NFL is one of the warriors for social justice, because they think that’s what its audience wants, which is why I ask if they even know who their crowd is, who their audience is. 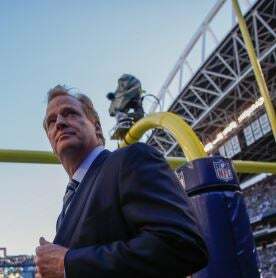 RUSH: We move on now folks to the National Football League and the league meetings yesterday which I think a lot of people had certain expectations that did not happen, that were not met. First off, the commissioner Roger Goodell at the owners meeting — this is the press conference — started a little after 2 o’clock, I think, if I have my time zones correct. I was in the air watching this when it happened. And I think it was 2 o’clock Eastern time when I — yeah. It was Eastern time. I remember that now. We have two bites from Goodell, actually three from Goodell, but this is the first one of the three. GOODELL: We believe everyone should stand for the national anthem. That’s an important part of our policy. It’s also an important part of our game that we all take great pride in. And it’s also important for us to honor our flag and to our country, and we think our fans expect us to do that. And so that is something that we continued to focus on this morning, but really talking a lot about the opportunity that exists with our players to try to go and really make a difference in our communities in a positive way. RUSH: Well, there it was. That started the flood, if you will, of “making a difference in our communities in a positive way.” You know, I often get in trouble for this, but this phrase, and it’s generally uttered by younger people who are trying to impress older people, particularly those who might hire them. Well, does that even happen? Do young people try to impress older people anymore or are younger people telling older people how screwed up they are? You know, I’m the mayor of Realville. I’m a literalist. “I want to make a difference,” it’s generally assumed it means you want to make the world a better place, you want to do this or that. But, know, when it comes to platitudes, I kind of like putting up a stop sign. But that’s just me as the mayor of Realville. They looked it up, and he was right. So then they said, “Nothing to see here. The law’s stupid. It’s not enforceable. It isn’t any big deal. And instead of standing for the anthem we are going to work with our players to go out there and really make a difference in our community in a positive way.” What does this mean? “I am the leader of trash collection in my community.” She was very proud. That’s the first time I was aware of “the community” type stuff. And now we got all kinds. We got the intelligence community. We have the military community. We have the journalist community. We got communities of everything now. And so now the NFL is going to be working really hard to make a difference in their communities in a positive way. Here’s the next statement from the commissioner Roger Goodell. RUSH: Stop the tape. I forgot to tell you the question. The question would matter here. You don’t really need it, but he was asked a question here by a reporter. “It’s in the operations manual, commissioner, that a player should be on the field for the anthem, they should stand at attention, hold their helmets in their hand. It’s not a rule but it’s the policy, so why not make it a rule, since fans seems to want it, ratings seem to be down, why not make it a rule? GOODELL: — what we tried to is deal with the underlying issue and understand what it is that they’re protesting and try to address that matter. GOODELL: The important thing for us is to be able to do that and take that opportunity to make real differences in our community. And the protests started on a Sunday after the 49ers had played on a Thursday. They missed out on the first round of protests so now they’re having to catch up on it. But they have, one was 33 of them alone I think kneeled out of a roster of 53. Six or seven. And so they blew up out there in the sports Drive-Bys and elsewhere at Jerry Jones and then accused him — well, they accused and asked, “Is Jerry Jones gonna try to take over the meeting today? You know, he does that, Jerry Jones, he dominates these owners meetings anyway. Is he gonna come in here, is he gonna take over? Is he gonna demand every one of these owners agree that the players don’t play if they don’t stand up?” So when Jerry Jones arrived at the NFL office, this is what happened. UNIDENTIFIED PROTESTER: You want to treat them like $40 million dollar slaves, gladiators who are well paid to beat each other’s brains out, but have to keep their mouths shut when talking about injustice. Look at the videos of the police getting away with murder and tell me that the players are wrong to protest it and that they have no rights to do that. People need to take a knee against white supremacy. And people need to stand up against you and your buddy Donald Trump and drive his whole regime out and it begins November 4th. RUSH: That was in the lobby of the Conrad Hotel where the owners meetings were taking place and they were heckling Jerry Jones as he walked in. Now, it sounds like the protester had a microphone. It sounds like the protester had a PA system. It sounds like the protester hates Trump. It sounds like the protester thinks the cops are out there murdering people. I bet the protester believes “hands up, don’t shoot” actually happened. Forty million dollar slaves. So I asked earlier in the program, ’cause I wrote a friend of mine who had offered an opinion, I wrote back and I said, “You know, I’m beginning to ask myself, do these people really not know who their fans are, who their audience is, or do they know and it embarrasses them?” Because, folks, everything this league is doing, everything they run out there and say is only furthering the problem that they are having. Donald Trump didn’t hijack anything. The players in the National Football League decided to hijack the national anthem after one player, Colin Kaepernick, did it last season, and out of the blue they all started doing it this year — well, many of them started doing it this year, and many of them don’t know what they’re doing. Some think they’re protesting Trump. Some think they’re protesting police brutality. And the owners, as we’ve been over and over and over again here, the owners don’t know what to do with this. They don’t know what side of this to come down on. To them the safest route is to support the players. And it just makes me think that I think this is a storm that they think they’re gonna weather and at some point in the future all this is gonna be forgotten and they’ll be on to some other controversy or some other thing they have to deal with. But eventually people are gonna get tired, show back up. Once we get deeper in the season and the games start having a little bit more meaning, get into playoffs, the fans are gonna come back, the TV ratings are gonna coming back. The TV money is never gonna leave because what else is there for the networks to televise on Sunday afternoon but us, so the money’s always gonna be there. This does not make sense to me. When the solution to this is so easy. What’s the solution? Give them an opportunity to protest whatever, you know, do police brutality month in the NFL if you want. Make ’em stand during the anthem. Anything like this they do, it’s gonna hurt, because this is not why people watch football, and they don’t want ideological corruption of the game. And yet that is what’s happening. Now, we put together this montage of Goodell. We invented this technique, by the way, many, many moons ago. Everybody in the media copies it, but this one, I asked Cookie, I said, “Where is it? I don’t see it on the roster.” She said, “Well, I didn’t give it to you because everybody’s doing it.” I said, “It doesn’t mean we don’t.” So she put it together. The whole thing’s a minute 44. I’m not gonna play this whole thing, but just to give you a flavor. GOODELL MONTAGE: Let me say that our players are men of great character. They have a very deep understanding and tremendous knowledge of the issues that are going on in all of our communities. The players were very clear about how they felt about these issues and how deeply they felt about these issues in our communities. These aren’t really issues that are player issues or owner issues or community issues; they’re issues that affect all of us in our communities. We wanted to work together to try to address these issues. We spent today talking about the issues that our players have been trying to bring attention to about issues in our communities, to make our communities better. There’s nothing more important than trying to give back into our communities and make our communities better. The relationships between our clubs, our players, our communities. The relationship between the players and our communities and our law enforcement. These are important issues for our communities. They’re American issues. I think those are the key issues. I would tell you, though, just on one other issue that — and really make a difference in our communities in a positive way and to try to help and make differences in our community. It was the underlining issue. Differences in our community. ‘Cause this is a long-term issue. That’s why we’re trying to deal with those underlying issues. We’re gonna continue to work on these issues in the community. RUSH: Stop the tape. Do you think that they focus grouped it? Did they focus group this? Did they take surveys, they take polls, is “communities” a buzzword for certain demographics? Is “communities” and then doing work in restoring and all that, is that how you reach Millennials? That’s who everybody wants. You get Millennials and then you figure you have the future. They glom onto your product and you keep ’em and you’ve got ’em, you know, 30, 40 more years. Is that what this is? Or is this what Goodell’s hearing the players say? But who talks this way? And who sets up a business with this as the objective? I can’t think of one. This is why I’m asking, do they know who their audience is or do they not know or do they know and are embarrassed by it and trying to change it? I can’t figure it out. RUSH: All right. All right. I checked the email, and you people are wise. I know what the communities reference is. But if I act like I know everything, it leaves no room for people to know something I don’t know. And everybody needs to feel like they know something. I don’t. It’s self-esteem. I know what communities, I know what that reference is all about. I know exactly. So do you. What was Barack Hussein Obama before he was a senator? He was what? Community organizer. The word has a very specific and narrow definition and application. Koley in Maine. Great to have you on the program. Welcome. CALLER: Hi, Rush. Thank you. CALLER: I would like to hear from all of the military that are overseas, all the military that are retired, and how about we add on all the military men and women that are wounded right now for fighting for our freedom, for our safety. 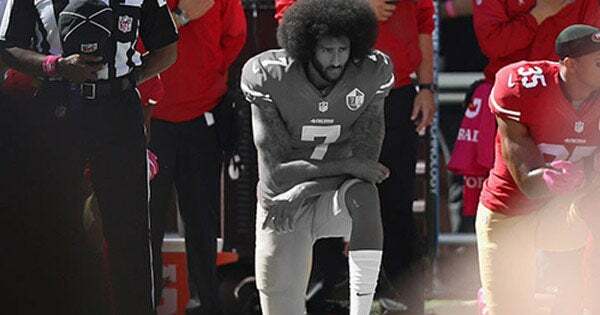 I would love for those football players to stand before them, give ’em their cockamamie story of why they cannot honor America and our American flag, our national anthem. And I’d like to hear their opinion, all these American men and women, of the spoiled brat mentality of these football players and how they cannot honor all of this. They just can’t. 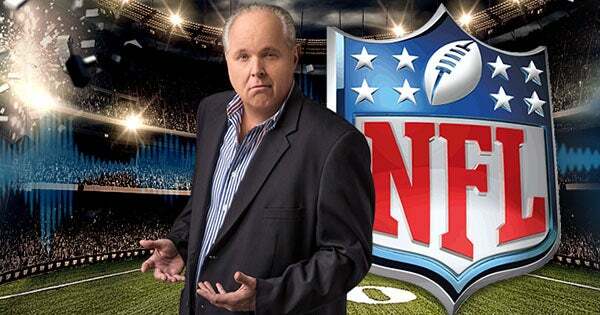 RUSH: Well, the players are wise to what’s going on. By the way, the military people would tell you this is why we fight and die, for people to be able to engage in this. That’s what they would all tell you. Some would tell you it hurts. Some would tell you that it angers them, but it’s still what they do. But the players, the ones that are speaking about this, are trying to make the point now, Koley, that it isn’t about the flag, it isn’t about the anthem. It’s about the police and Trump. And it’s about murder of innocent African-Americans, and it’s about Trump. They are protesting Trump. They’re trying to say that they’re not protesting the anthem or the flag at all. And the reason for that is is because that’s how it’s seen, and they know that that’s how it’s gonna be seen. And so they’re trying to tell people, “No, no, we love the flag, we love the anthem, that’s why we’re doing this.” They know they’re caught, in a way. RUSH: Back to the phones we go, Dan in Travers City, Michigan. Welcome, sir. I’m glad you waited. How are you? CALLER: Thank you, Rush. It’s an honor to speak to one of the three most powerful men in the country, and that would be Rush Limbaugh, Sean Hannity, and President Trump. RUSH: Wow, I appreciate that. Thank you, sir, very much. RUSH: Wait, wait, wait. Hang on. I want to go with you step by step on this ’cause this intrigues me. So let’s assume that this happened during Obama. Your theory is that it gets him treated as the whole country agrees, the whole country supports the players. Obama would have spoken out in favor of them, and a misrepresentation of who and what the country is would then have ensued, right? You’re saying it’s a new day now. They do this kind of stuff expecting –after eight years of Obama — it’s gonna be applauded and supported, and, lo and behold, they find out it’s a new day? CALLER: Rush, that is why you are absolutely awesome. That’s exactly what I’m saying. They just… Let’s just call it the Clinton half of the country ’cause Hillary was… They just still don’t realize it wasn’t a normal changeover to a normal Republican. And we… Okay. And so the Trump half of the country not… Okay. So let’s go to point now. So not only Trump has the country on the flag, we’re not standing for you disrespecting the flag period and we’re forceful about it. But then they say, “Well, because of racial discrimination,” so at least maybe the Trump half of the country will accept that. RUSH: Okay. So what do you think it…? Where do you think it’s gonna end up? CALLER: You mean the NFL thing? RUSH: Yeah, this whole thing! How’s it gonna end? It’s gotta have an end at some point. What is that gonna be? CALLER: Well, the NFL end or was it the country end? Which are you referring to? How the NFL is gonna end up? RUSH: — the players protesting, the league supporting them, the owners supporting them and now the league and the owners joining forces to basically say, “No, we’re protesting the president.” Although the league hasn’t pretty much said that but they’re implying it. Where does this end? CALLER: Okay. I think… Rush, I think it’s gonna end where the league right now… You can tell and you laid it out perfectly. They’re used to the Obama years where they get praise, and now they’re not getting praise anymore, so they don’t know what the hell to do, and I think they’re gonna — each day — move away from the whole thing, and they’re gonna tell the players, “you lost on three strikes. “People don’t feel you’re discriminated against anymore. It’s your own behavior that’s bringing the problem on the black community. People feel they can’t criticize a black person anymore ’cause they’re afraid of being called a racist, and people aren’t gonna stand for you disrespecting the country.” I think the NFL has lost on three fronts. It’s a new day, and I think it’s gonna end in a few weeks, And there won’t be many black players kneeling.